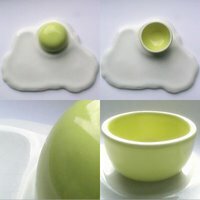 Egg cup creators are always looking for new sources of inspiration, and it could be that sometimes they don't look very far. What should they? 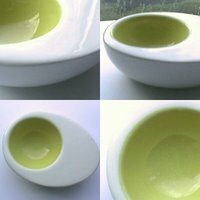 Doesn't the egg itself have a marvelous shape, as well as unforgettable colours? 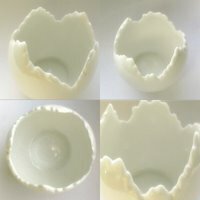 In this selection we can see egg cups inspired more or less directly in different types of eggs or egg's states: hard-boiled, fried, as an eggshell or as a broken eggshell, for instance. 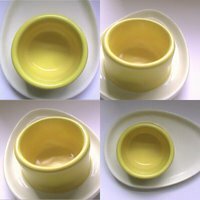 I haven't found yet any egg cups imitating scrambled eggs, or maybe I found them but didn't recognise them. 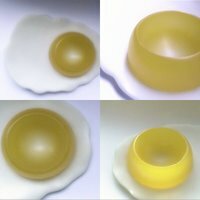 The important thing to know is that egg shaped egg cups produce what art critics love to call the mise-en-abîme effect: you'll eat your egg in an egg. 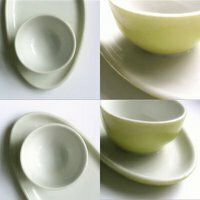 Known and maybe useful details: 1) no marks, bought in Italy in 1985 [eggcup0200]; 2) made in Thailand, Ikea [eggcup2878]; 3) made in Vietnam in 1999, Ikea [eggcup1982]; 4) made in Japan [eggcup1948]; 5) marked "Swed. reg. design No. 98/1959 Internat. regd. desn. 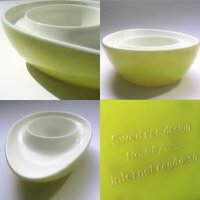 ", which means it was registered in Sweden [eggcup3359] 6) produced by Carlton Ware, end 70s/beginning 80s (United Kingdom) [eggcup2255]; 7) produced by Sia [eggcup2997]; 8) produced by Casablanca (Germany) [eggcup2147]. 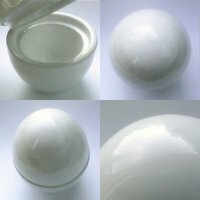 You probably already know where do eggs come from, but even so you may want to check the Poultry egg cups post.